Getting out of the house gives a dog the chance to express its natural behaviour, check out the neighbourhood for new smells, go to the toilet, possibly go for a run and play with other dogs or fetch a ball. A backyard is no substitute for a walk: most dogs will not self-exercise in the back yard, especially if they are “only” dogs. Backyards simply do not provide adequate stimulation. Dogs are significantly less likely to develop behavioural problems such as barking, digging and other destructive behaviours if they get regular exercise. Most people know that dogs should be taken for a walk daily, but time constraints may prevent the owner from providing this basic need. So “Max” gets less exercise, and he puts on weight. Cats are often confined to the house in order to avoid road traffic and cat fights, resulting in inactivity and weight gain. Pet obesity has become a common problem in the western world. Risk factors for the development of obesity in pets include breed (predisposed are the cocker spaniel, labrador retriever, golden retriever, dachshund, shetland sheepdog, rottweiler and others), lifestyle (indoor cats, apartment living), neutering and age. Studies show that desexed pets are more likely to become overweight, but the behavioural and health benefits of desexing far outweigh the negative effects of weight gain, which are easily controlled by a modified diet. Older dogs and cats are more likely to put on weight because they are less likely to feel the need to self-exercise and become sedentary if they suffer joint pain due to arthritis. Links between cat anxiety/depression and weight gain are possible, although studies on the subject are lacking. Veterinarians addressing the obesity issue in the clinic are confronting an often delicate subject. Commonly, obese pets have obese owners; pointing out that the dog is overweight leaves the owner embarrassed and thinking about their own weight issues. Obesity results when there is a mismatch between energy expenditure and intake. Underexercising is one of the issues leading to weight gain, and overfeeding is another major contributing factor. Probably the most common response I get from clients with overweight pets begins, “But I only feed him …” Once questioned carefully, most people will admit to feeding the dog leftovers – a piece of toast at breakfast, a piece of cheese at lunchtime, and just one small biscuit after dinner. I find that it is hard for people to put into perspective the amount of food their pet needs. A 10 kg dog that is only moderately active needs less than one-tenth of the average daily food for an average person. This may amount to less than a cup of dry food per day. A piece of cheese at lunchtime represents almost half the daily calories that a small inactive dog needs. We have to remember that most dogs and cats spend a very large portion of their day sleeping whilst we are busy working, shopping, cooking, cleaning the house – doing activities that use up energy. As it does for people, obesity results in a vast array of health issues for pets. Obesity significantly increases the risk of diseases such as cancer, osteoarthritis, diabetes mellitus, pancreatitis and cardio-respiratory problems. Additional to the suffering this causes pets and owners is the financial burden of treatment. Pancreatitis is a disease seen more often in overweight animals, although it can also be related to other causes. It results in serious inflammation and “self-digestion” of the pancreas, an organ responsible for secreting our digestive enzymes. We see a lot of pancreatitis in our practice, and treatment involves prolonged hospitalisation. Costs commonly escalate to $2000–3000. The prognosis is always guarded, and some dogs will not recover, especially if they have previously suffered an episode of acute pancreatitis. Diabetes, which is also linked to obesity, is common in dogs and cats. Treatment involves twice-daily insulin injections given by the owner and regular blood glucose checks at the vet clinic. Obesity is a major risk factor in the development of both traumatic and degenerative orthopaedic disorders, so heavy dogs are more likely to suffer cranial cruciate ligament rupture and intervertebral disk disease, both of which usually require surgical treatment and involve prolonged recovery. A number of studies suggest that weight loss has a direct effect on improved mobility and reduced pain in animals suffering from osteo-arthritis. Long-term use of non-steroidal anti-inflammatory drugs, which are commonly used to treat arthritis, may have side-effects on the stomach, liver and kidneys, so reducing the need for these medications will benefit the animal. Dogs that already have a predisposition to tracheal collapse (flattening of the windpipe), brachycephalic airway obstruction (such as pugs that have small nostrils and long, soft palates) or laryngeal paralysis will be significantly worse off when they are overweight. In addition to the conditions that affect dogs, overweight cats are prone to lower urinary tract disease (which leads to crystal formation/urinary tract infections or non-specific inflammation of the bladder) and an accumulation of fat in the liver, which leads to liver disease. They may also struggle to groom themselves properly, which can lead to other problems such as matted or dirty fur and skin infections. So how do you prevent or treat obesity in your dog or cat? First, get your pet checked out by a vet. Rarely, an underlying disease such as hypothyroidism or Cushing’s disease may cause a dog to appear overweight or to struggle to maintain a healthy weight. A dog with hypothyroidism produces less thyroid hormone than normal, resulting in poor coat condition, lethargy, a soft cough and weight gain. Cushing’s disease is a more common disease of elderly dogs, and results in overproduction of cortisol in the body. Symptoms may include a pot-bellied appearance, increased thirst and hunger, and panting. The vet may recommend some routine blood screens – always a good idea for an older animal anyway. Whilst at the clinic, have your dog or cat weighed, discuss an “ideal” weight and talk to the nurses or vets about setting achievable goals over a set period of time. Most vet clinics will be very happy for you to bring your pet for a regular weigh-in to check progress. 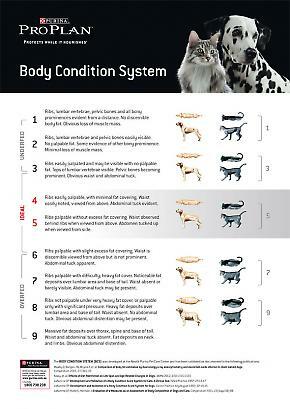 Most vets will also apply a body condition scoring system, which is a scale from 1 (emaciated) to 9 (obese). 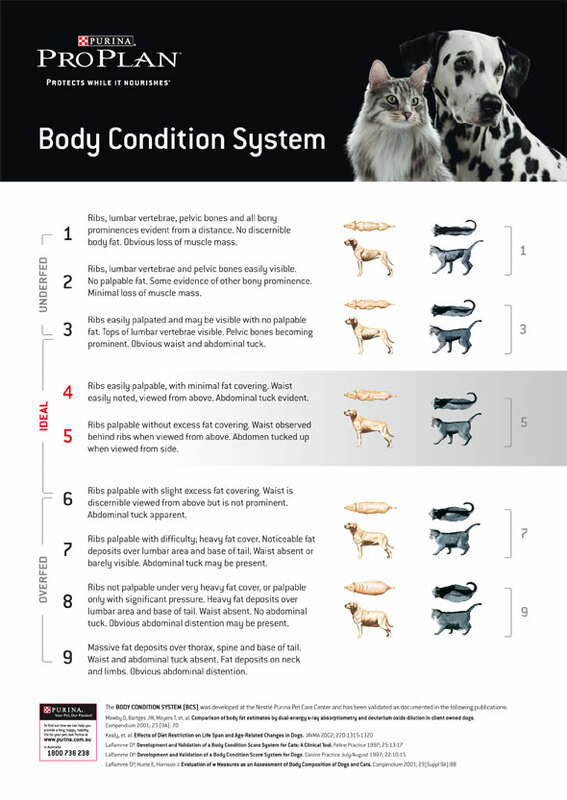 Every pet should have easily palpable ribs and a “waist”; that is, when observing the pet from above, the abdomen should cave in slightly from the ribs. A “barrel” shape is not desirable. Put simply, losing weight requires energy in to be less than energy out. Raw bones can make up an essential part of a dog’s and cat’s diet to maintain oral health, but the high fat content of bone marrow must be factored into the caloric intake. Older, less active pets should be fed a good quality commercial senior diet, which is typically lower in calories compared with an adult food. It is important to minimise treats and take your dog for a walk, at least once per day, every day – it won’t do you any harm either. Dogs that are already overweight need to be reintroduced to exercise gradually. Avoid very hot days when going for a run with your overweight labrador – heat stroke is a real danger! Swimming is a wonderful way to exercise a dog because it puts little pressure on sore joints. Increasing the amount of exercise for your indoor cat is a simple matter of playing. Ideally, set aside 10–15 minutes twice daily to engage your cat in play, such as chasing toys on bits of string or the light coming from a laser pointer. Robotic and remote controlled cat toys are also available. Cats should have a scratching post with elevated platforms that allow jumping up and down, which will ensure they maintain strong muscles and joints. If possible, encourage physical activity by building an outdoor run for the cat that is connected to the house so the cat can come in and out without being allowed to roam. Basically, the more exercise you can give your cat, the better. However, it is more difficult to get a cat to lose weight than a dog. It is not uncommon to come across one very overweight and one normal weight cat in the same household. Some cats are keener on food than others and will polish off the other cat’s food, in which case it is very important to feed the cats separately. Special weight reduction diets are available to help with weight loss programs for cats and dogs. Your vet will be able to advise you about diets to choose and how much to feed. Get the whole family together and stress how important your dog or cat’s weight loss is for their health and that everyone is responsible for helping the pet to lose weight. A fit and lean animal is likely to have a much higher quality of life, live longer and is significantly less likely to acquire a variety of common health problems. And it will cost you less money!